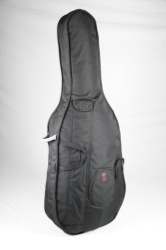 Kaces' University line of cello bags features 20mm high density foam padding, a bow pocket, accessory compartments, and multiple double stitched handles and backpack straps for easy carrying. Available in 1/4-4/4 sizes. 1 year limited warranty.